The 29th Annual Skull Creek 4th of July Celebration is a free community fireworks display launched from a barge in the Intracoastal Waterway/Skull Creek, starting at 9:30 p.m. on Thursday, July 4, 2013. Live entertainment is scheduled to start 6 p.m. at Hudson’s Seafood House on the Docks, Chart House and Skull Creek Boathouse. Food and beverage will be available at all three locations. No coolers, please. The event is sponsored by Chart House, Country Club of Hilton Head, Hargray, Hilton Head Plantation POA, Hudson’s Seafood House on the Docks, AM 1130 FM 93.5 The Island, The Island Packet, Old Fort Pub, Palmetto Electric Co-Op, Pearlstine Distributors, Skull Creek Boathouse, and the Town of Hilton Head Island. Free parking and shuttle service available from 6-10 p.m. from the Boys & Girls Club on Gum Tree Rd. to parking lot at Chart House, Hudson’s and Skull Creek Boathouse (pick-up & return). Shuttle provided compliments of SHARE. For additional information, please call (843) 681-2772 ext. 100. Bear Foot Sports is excited to announce that this year’s Publix Hilton Head Firecracker 5000 run will feature a new location and course and be staged from scenic Jarvis Creek Park. 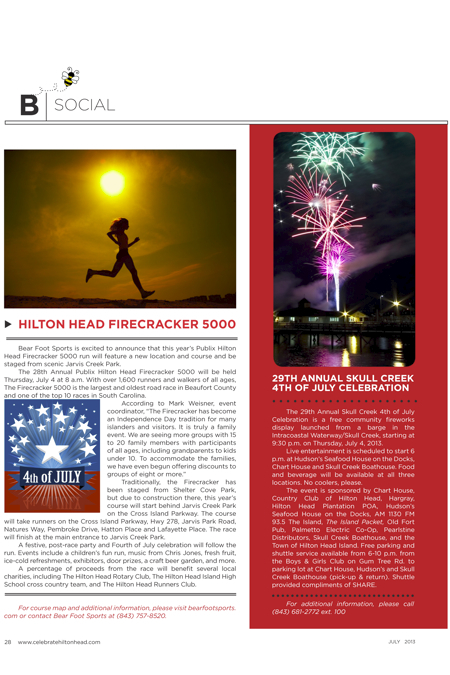 The 28th Annual Publix Hilton Head Firecracker 5000 will be held Thursday, July 4 at 8 a.m. With over 1,600 runners and walkers of all ages, The Firecracker 5000 is the largest and oldest road race in Beaufort County and one of the top 10 races in South Carolina. Traditionally, the Firecracker has been staged from Shelter Cove Park, but due to construction there, this year’s course will start behind Jarvis Creek Park on the Cross Island Parkway. The course will take runners on the Cross Island Parkway, Hwy 278, Jarvis Park Road, Natures Way, Pembroke Drive, Hatton Place and Lafayette Place. The race will finish at the main entrance to Jarvis Creek Park. A festive, post-race party and Fourth of July celebration will follow the run. Events include a children’s fun run, music from Chris Jones, fresh fruit, ice-cold refreshments, exhibitors, door prizes, a craft beer garden, and more. A percentage of proceeds from the race will benefit several local charities, including The Hilton Head Rotary Club, The Hilton Head Island High School cross country team, and The Hilton Head Runners Club. contact Bear Foot Sports at (843) 757-8520. In 1988, when musician Shannon Tanner first took the stage at Shelter Cove Harbour, he never imagined that 25 years later he’d still be singing “The Unicorn Song” to packed crowds and performing for some of the same children who are now grown with their own little ones. The annual Hilton Head Island and Southern summer phenomenon known as HarbourFest features the beloved Tanner, weekly Tuesday night fireworks and family-friendly entertainment and will take place May 24 through Labor Day, Sept 2. Tanner will perform two shows Monday-Thursday at 6:30 and 8 p.m. at the pavilion at Shelter Cove Harbour, featuring fan favorites like “My Hair Had a Party Last Night” and “Flying Purple People Eater” along with new music. Tanner’s entertaining multi-generational show gets the crowd involved in his songs through energetic and animated singing and dancing. HarbourFest also includes weekly fireworks, weather permitting, on select Tuesday evenings beginning at dusk. This year’s remaining fireworks shows over Broad Creek in Shelter Cove Harbour are scheduled for July 4, 9, 16, 23 & 30 and August 6 & 13. Guided kayak tours and boat cruises leave from Shelter Cove Harbour for a view of the fireworks from the water. There are also a host of family-friendly activities at Shelter Cove Harbour during HarbourFest, some limited to Tuesday night, including face painting, bounce houses, balloon animals, arts & crafts, practice putting and a variety of interactive games and activities. 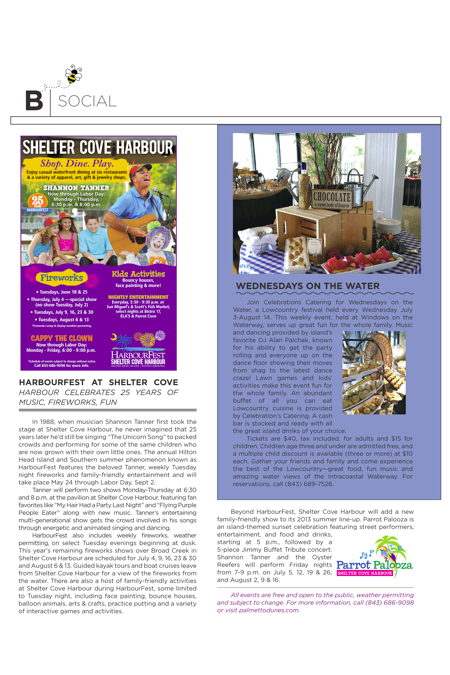 Beyond HarbourFest, Shelter Cove Harbour will add a new family-friendly show to its 2013 summer line-up. Parrot Palooza is an island-themed sunset celebration featuring street performers, entertainment, and food and drinks, starting at 5 p.m., followed by a 5-piece Jimmy Buffet Tribute concert. Shannon Tanner and the Oyster Reefers will perform Friday nights from 7-9 p.m. on July 5, 12, 19 & 26; and August 2, 9 & 16. All events are free and open to the public, weather permitting and subject to change. For more information, call (843) 686-9098 or visit palmettodunes.com. The South Carolina Watermedia Society (SCWS) announces its annual juried art competition. The opening reception will be held from 4 to 6 p.m. on July 13 at Coastal Discovery Museum on Hilton Head Island. The exhibition will run July 13-August 24. The juror for the show is Linda Baker, an internationally-renowned watercolorist now residing in Charleston, S.C. The exhibition will feature 66 of the most talented water-based media artists from across South Carolina and North Carolina. Baker chose the top 30 award-winning paintings on June 16, which will be announced during the July 13 award ceremony. After the conclusion of the show on July 24, the 30-award winning paintings will be featured in a show that will travel throughout the state. The exhibit will provide public access to the “best of the best” and is facilitated by the South Carolina State Museum. The exhibition will culminate with the 30-award winning entries featured in a show that will travel throughout the state. The exhibit will provide public access to the “best of the best” and is facilitated by the South Carolina State Museum. The SCWS is the only statewide visual arts organization in South Carolina. It is a nonprofit organization that nurtures and promotes artists who work in watermedia (watercolor, acrylic, gouache, casein and mixed media in conjunction with watermedia on any surface) by providing exhibition opportunities, professional development, and educational programs. The public is provided with many quality art experiences, including exhibitions and art education in the form of lectures, demonstrations, and workshops. For more than 25 years, cities across the state have hosted the Annual Traveling Exhibition; more than 20,000 visitors viewed the exhibition last year. Join Celebrations Catering for Wednesdays on the Water, a Lowcountry festival held every Wednesday July 3-August 14. This weekly event, held at Windows on the Waterway, serves up great fun for the whole family. Music and dancing provided by island’s favorite DJ Alan Palchak, known for his ability to get the party rolling and everyone up on the dance floor showing their moves from shag to the latest dance craze! Lawn games and kids’ activities make this event fun for the whole family. An abundant buffet of all you can eat Lowcountry cuisine is provided by Celebration’s Catering. A cash bar is stocked and ready with all the great island drinks of your choice. Tickets are $40, tax included, for adults and $15 for children. Children age three and under are admitted free, and a multiple child discount is available (three or more) at $10 each. Gather your friends and family and come experience the best of the Lowcountry—great food, fun music and amazing water views of the Intracoastal Waterway. For reservations, call (843) 689-7526.